First things first, the book's foreword is written by Hew Strachan who greatly praises the work. Next up is this praise, among others, from Andrew Roberts. "It will be decades before this book is superseded as the best account of those extraordinary events of 1815". Now that those two items have been gone over, I guess there isn't much left to say. After two heavyweights in the field declare for you it is pretty much a slam dunk. With not even a flyweight's credentials, I will try to add my views on this excellent volume, and describe what the reader will see. First off there are thirty-two very well done maps. Why books on military campaigns and battles don't have more or better maps like this one I do not know. There are also twelve tables. Some of the tables and maps are two pages large. This is a tome at 584 pages with a further 126 pages of notes and index. Just remember, this is only volume one of two. The book starts out with how, according to the author, the Allies "lost the peace', and Napoleon safely ensconced on Elba. The author goes into every countries Machiavellian schemes, and their diplomats weaving their webs of deceit. Not forgotten is the master arachnid Metternich, and his attempt to turn back the clock to 1788. The book then goes into the plans of the Allied commanders to uproot Napoleon once and for all. Wellington's and Blucher's plans for the upcoming campaign are gone through minutely. The polyglot 'British' army and all of its disparate nationalities attempting to act as one is also gone into. Strangely, most of these commanders believed that Napoleon would stay on the defensive and await their disparate attacks. The author moves from geopolitical to battalion concerns and history effortlessly. We are shown Napoleon's plan of attack into Belgium, and the reconstitution of the 'Grande Armee'. The battles of Ligny and Quatre Bras are gone into in minute detail. The book is interspersed with the actual dispatches and memoirs of the combatants. The author has used sources in four languages to tell this amazing story. There is not much else to add. If you are looking for a one volume history of Napoleon's escape from Elba to the twin battles of Quatre Bras and Ligny, this is it. 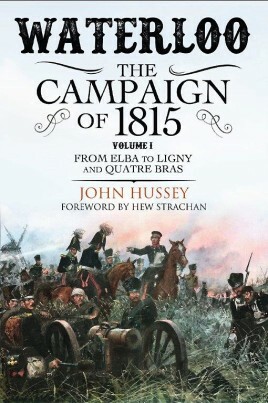 I cannot wait for the release of Volume II, and the author's telling of the battles of Waterloo and Wavre.